New fun and challenging events!. * Sea of Words. * Glittering Grove. * Star Explorer. . Plus 400 additional levels to solve! Can you solve all the cross word puzzles? Even with unlimited tries, it&apos;s a challenge!This modern word game is tremendous brain challenging fun. Enjoy modern word puzzles with the best of word searching and crosswords!You’ll never experience a dull moment after you try this addicting wor... see more Can you solve all the cross word puzzles? Even with unlimited tries, it&apos;s a challenge! This modern word game is tremendous brain challenging fun. Enjoy modern word puzzles with the best of word searching and crosswords! ➤ Get your word hunt on with over 3,700 puzzles! 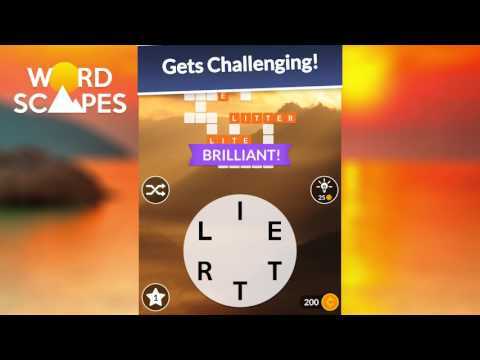 Wordscapes is the word hunt game that over 10 million people just can&apos;t stop playing! It&apos;s a perfect fit for fans of crossword or word anagram games, combining best of word find games and crossword puzzles. The latest top-rated word game, from the makers of Word Chums, Word Mocha, Word Vistas, Spell Blitz and MixTwo.